Before moving to Israel I figured that once here my treyf* supply would be cut. I thought it would be something like obtaining beef in India, where restaurants need special licenses to serve it. I resigned myself to months without bacon, pork chops, shrimp, and scallops. But I also figured a break from it wouldn’t be the worst thing in the world – in the past year alone I’ve had bacon in everything from chocolate to cupcakes, and from bourbon to donuts, and I’m sure my cholesterol is skyrocketing. What I wasn’t counting on was that although Israel is a Jewish state, its citizens come from around the world and practice varying levels of observance and varying religions. Most of the high end “chef” restaurants, as they call them here, are far from kosher and most cities have a few markets that cater to the non-kosher crowd. The exception to this rule is Jerusalem, where some restaurants that serve treyf require armed guards and you’d be hard-pressed to find a cut of pork. In Be’er Sheva there are any number of non-kosher restaurants where you can get shellfish and cheeseburgers, and at least two supermarkets that sell treyf. These Russian-owned supermarkets are open on Shabbat and stock pork in the butcher counter and frozen shrimp alongside the more typical salmon (most of the fish here is frozen and from Thailand or Vietnam). And both options are far cheaper than beef, and about the price of chicken. I’ve had shrimp twice since I’ve been here (at the tapas restaurant and at the Castle) but have yet to make it. It was time. 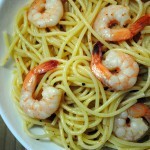 This garlicky spaghetti, inspired by a Gourmet recipe for Shrimp Scampi Pasta, is quick and simple to make but packed with flavor. The sauce that forms from the oil, butter, and wine is silky and satisfying. The shrimp cooks quickly; overcooking it will make the texture rubbery so remove them from the pan when they turn pink. 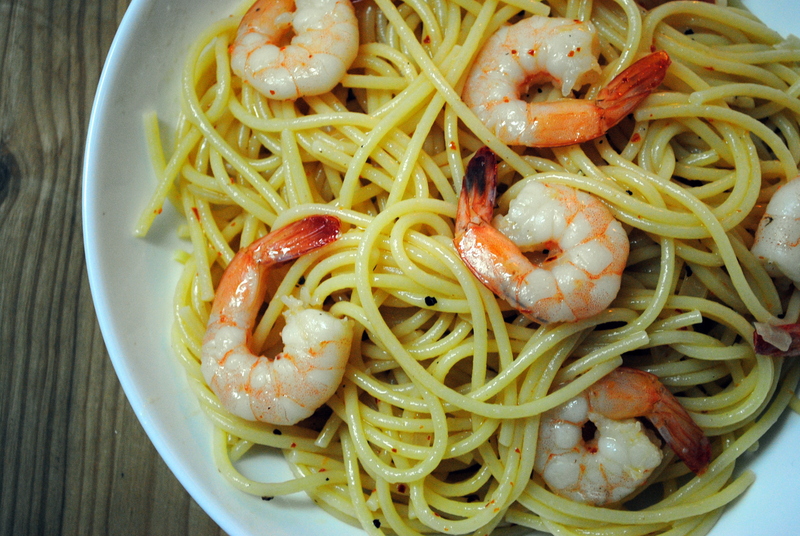 Adjust the amount of red pepper flakes to suit your tastes. *Treyf – any food which is not kosher according to the Jewish laws of kashrut (Jewish dietary laws). Treyf includes all pork and shellfish, as well as the mixing of meat and milk. 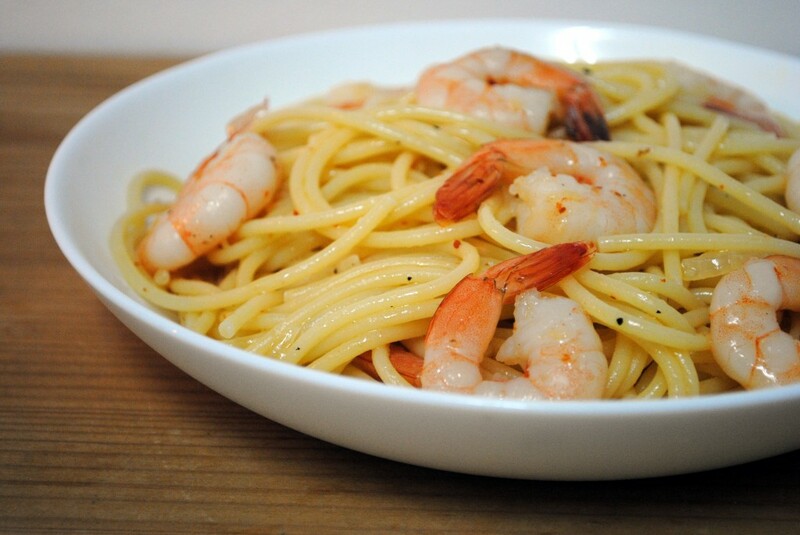 Cook the pasta in a large pot of boiling water; reserve 1 cup of pasta water, drain, and set aside. 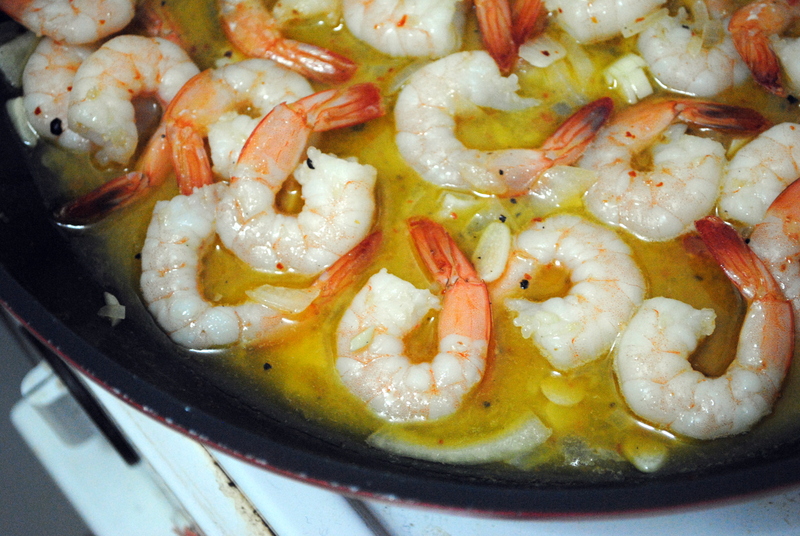 Meanwhile, heat oil in a 12-inch heavy skillet over moderately high heat until hot but not smoking, then sauté shrimp and garlic until just pink and cooked through, about 2 minutes, and transfer with a slotted spoon to a large bowl. Add wine and red pepper flakes to oil remaining in skillet and season with salt and pepper. Cook over high heat, stirring occasionally, 1 minute. Add butter to skillet and stir until melted. 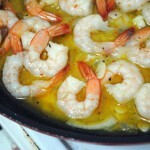 Stir in shrimp and remove skillet from heat. Add pasta to skillet and toss to combine, adding some of the reserved cooking water if necessary. Serve immediately. Oh yes – I definitely think this recipe would be very pleasing to my palette! I might even make it 6 large cloves of garlic. 🙂 So simple but yet it sounds very, very tasty. 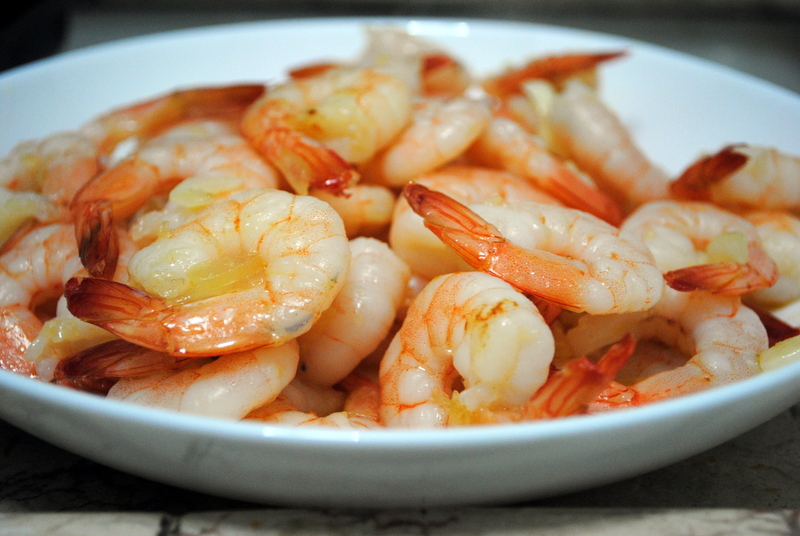 I see a bowl of garlicky shrimp in my future!